There are two types of Chiropractors. The musculoskeletal chiropractors who work on symptom relief and the traditional wellness chiropractors who work on subluxation and structural correction. Dr. Tyler Chalfant is a traditional wellness chiropractor. Simply put, a subluxation is a misaligned vertebrae which interferes with the nerve impulses. Nerve impulse is the electrical impulse from the brain that regulates all function of the body and keeps us alive. His primary focus of care is to remove the nerve interference (subluxation) and restructure the spine and posture to it's most stable biomechanical position. By maximizing the integrity of the discs, joints, and nerves through spinal adjustments and postural correction, the body's wellness i.e. health potential and ability to function, improves. This is achieved through a rehabilitation program of adjustments and spinal exercises. He is the only one in Dekalb County that takes pre and post x-ray studies so you can actually view the improvements. We believe that children should have their spines checked for spinal subluxations. Did you know that 80% of all childbirths result in Nerve Impingement Syndrome or Subluxation, 40% of all children fall on their heads by age one, accordning to OSHA: this can result in Nerve Impingement Syndrome or Subluxation and between the ages of two and five years old children fall over 200 times; this can be a major cause of Nerve Impingement Syndrome or Subluxation. Children are very active. They can spend an endless amount of time jumping, running and playing hard. Sometimes all of this physical activity can put an undue stress on spinal nerves, which can lower a child's resistance to a number of maladies. Childhood should be a time of fun and growth and preparation for a healthy adulthood. Many times children spend this joyous time plagued with adult-type problems such as fatigue, nervousness, poor concentration, headaches, back pain or irritability just to name a few. There is no such thing as growning pains, these things are not normal and should seek the consult of a wellness chiropractor. The child�s spine is developing rapidly in the first 10 years of life. Apparently innocent events, such as wearing backpacks, increasing use of the computer, having poor posture and getting injured playing sports, can create spinal subluxations (misalignments) in the child�s spine. 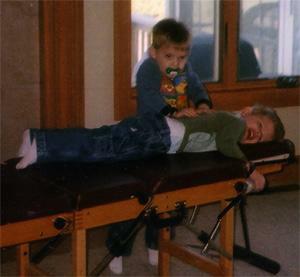 Subluxations can put pressure on the child�s nervous system. When the nerve isn�t functioning correctly, it can result in symptoms related to organs, muscles and various systems of the body. Symptoms such as colic, asthma, ear infections, stomach ache, bed wetting, poor posture, hyperactivity and frequent colds or flu might be evidence of subluxations. Through safe and gentle adjustments, a chiropractor can realign the child�s spine with specific contacts, reducing the pressure on the nervous system, allowing the body to heal and reduce symptoms. Like dentistry, many parents also see the benefits of providing preventive care for their children and see this as an important role in their child�s overall health and wellness. Chiropractors have been adjusting children�s spines for more than 100 years. When considering the use of any health care procedure, the benefits must be weighed against the risks. Chiropractic care has many proven benefits and malpractice insurance coverage has identified chiropractic as having an excellent safety record with low risk. The adjustments should begin even before the baby is born. The advantages of the mother having a properly aligned pelvis can assist in having a safe vaginal birth. During the last trimester of the pregnancy, if the pelvis is subluxated, the fetus can be in a malposition, causing in-utero constraint. This could make for a difficult birth. A chiropractor can position the mother�s pelvis to allow for the fetus to be in the proper position for a safer delivery. The evaluation for the baby can and should begin right after the baby is born. Even with a normal, noncomplicated birth, there is stress to a baby�s spine and nervous system. If an adjustment is needed, a nonforce pressure is given and kept to a minimum. From this day forward, children should be checked for subluxations on a regular basis by their chiropractor. Most people are unaware that today's Doctors of Chiropractic undergo virtually the same intense education process as Medical and Osteopathic students for the first two years of professional school. Medical students and Chiropractic students alike, spend a tremendous amount of time studying anatomy, physiology, neurology and other basic sciences. The main difference during the first two years is that Medical students have a heavy emphasis on pharmacology (study of prescription drugs) and Chiropractic students emphasize nutrition and natural alternatives to drugs. Are you among the thousands suffering needlessly because of a lack of understanding of your symptoms? If so, wouldn't you like to relieve these symptoms and return to a happier, healthier lifestyle? 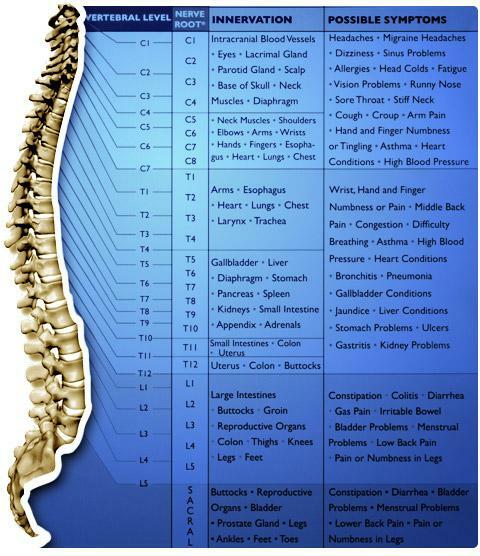 Seek Chiropractic today. Chiropractic began in 1895 and has since grown to being used by over 250 million people. It is actually only based on a few simple concepts. The body is a self-healing and self-regulating organism. The brain and nervous system are the master controlling system in the body. Anything that interferes with the nervous system reduces the body�s ability for health potential. Chiropractors are specially trained to identify and, through gentle spinal adjustments, correct interference in the nervous system. That means, a chiropractor helps your body stay at its best health potential, without medication. Only the body has the ability to heal. There is no pill, potion, surgery, or anything else that can heal the body from the outside in. The body has built all dis-ease known to man from within and has the capability to heal the same dis-ease through its own innate power. When the body's innate intelligence is interfered with through subluxation, stress, poor food and thought choices and lack of movement it loses its ability to repair and rebuild the cells in the body, therefore comprising your health and healing. The dis-ease is simply an imbalance in the body. A disease healed naturally leaves a person stronger. Above, you will see the Nervous System, which is the Master Controlling System in your body. The nervous system contains the brain, the spinal cord, and the nerves that extend from the spinal cord. The brain sends signals down the spinal cord and out the nerves which control all the organs, cells, and tissues in your body. The chiropractors job is to locate the subluxation (misalignment) in your spine. A subluxation can cause the nerve to become blocked, therefore not allowing proper nerve impulse or messages to be sent to its corresponding organ, cell and tissue; causing it to to become dis-eased. When this occurs you can experience symptoms such as the ones on the Nerve Chart. The Chiropractors job is to locate and remove the subluxation by gently moving the vertabrae back into proper alignment, therefore allowing the body to heal itself. If you are experiencing health issues that concern you or a loved one, then please call our office today to set-up an appointment @ (260) 925-0357.